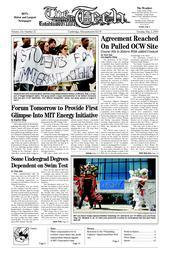 A front-page article on Friday, “Controversy Over Image Leads To Removal of OpenCourseWare Class Site,” was incomplete in its portrayal of the views of the Chinese students, many of whom wanted the sensitive material on the site introduced with better context, rather than removed altogether. Additionally, it incorrectly gave the first name of a professor who co-created the class — he is Shigeru Miyagawa. The history professor quoted in the article is Peter C. Perdue, not Peter Purdue. A front-page item listed in “In Short” in Friday’s issue incorrectly listed one of the offices relocating to the Student Center basement in May. It is the Fraternities, Sororities, and Independent Living Group (FSILG) Cooperative office, not the FSILG office, that will make the move.